The contraction behind the two is was originally built to bring down the entire city with some chains and lotsa pulling. The architects of the past were really ingenious weren't they. The beautiful Helga started her career mainly in PEPLUM films but today she's basically remembered for her so-called Eurocult films of the 1970s. But in my mind, she'll always be one of the Queens of the PEPLUM genre. 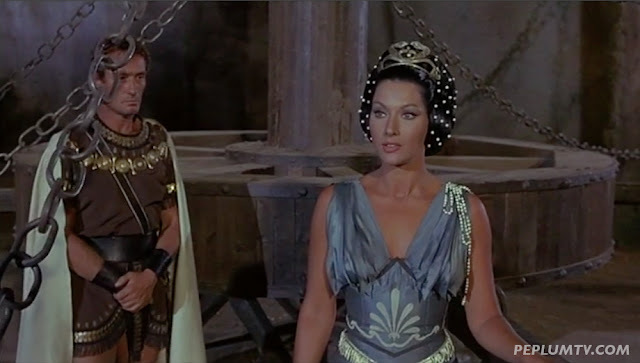 The device for destroying Babylon by winding up chains deserves the award for being the most preposterous machine in any movie. Good fun if one is a connoisseur of extreme campyness in cinema. The gigantic steam engine in Fritz Lang's "Metropolis" is a close second.